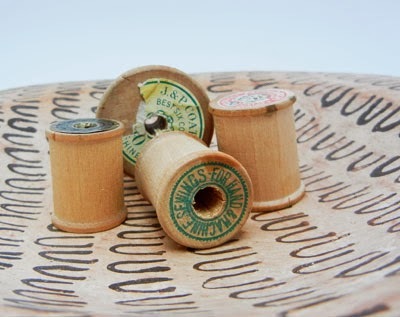 When challenged by Christine Altmiller of One Kiss Creations to create something using vintage wooden spools she found while antiquing, my first thought was: "How can I use needles in my design?" Not just in the execution, but in the design itself. My mom always had a needle in her hand when we were growing up, whether she was sewing our clothes, reupholstering the furniture, making drapes, darning socks or sitting down after dinner with her needlepoint. We loved to watch her take out the trussing needle, cut a length of colorful cotton thread and sew up the Thanksgiving turkey to secure the stuffing! It's a tradition I continue with my own family. While talking about Christine's challenge with my husband, Dan, over dinner, he suggested cutting the spools in half (which would definitely increase my design options) and offered to do the job himself. 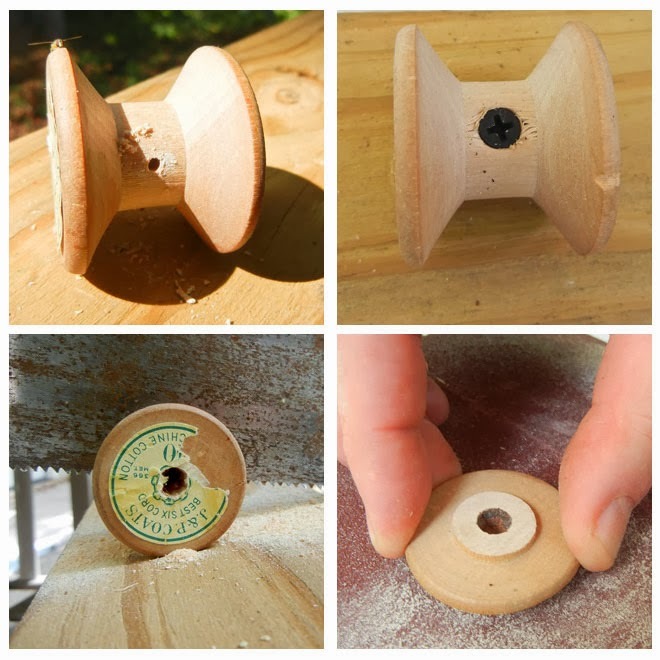 Holes were drilled in the center of each spool, which were then screwed into a block of wood to prevent them from flying across the deck. 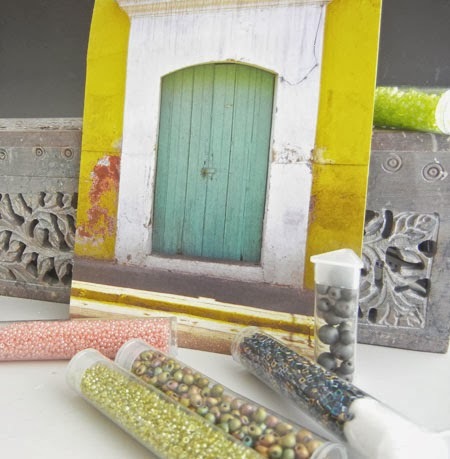 The spools arrived with this lovely card from Christine, and a selection of seed beads in the same colors as the card. How could Christine know that I've never been able to resist the lure of a closed door and love to imagine the lives that are being lived out behind them? You'll find photographs of ancient doors, rustic doors, and ornate gateways in every room of my house. Second design consideration solved: Christine's card gave my project its color palette. But I had chosen something a little more ornate for Christine's challenge, a necklace with a softly colored, more Elizabethan design. A friend recently managed an estate sale and held back a few special pieces for me, including three exquisite rhinestone buttons. The top component, with its gentle slope, was easy to bezel, but the middle component, with its steep sides, proved quite a challenge. After several failed attempts, I remembered a technique Laura McCabe teaches to embellish hardware washers, and once I secured the button to peyote-stitched tabs, and linked them around the spool's rim, I was on my way! The bottom component is an earwire form (recently learned in a Deryn Mentock class), inverted and embellished in ruby rondelles. The dangles are a collection of vintage needles, some of which I spray painted to match the spools. I had so much fun with this project! Thank you Christine, for inviting me to join you in this challenge. 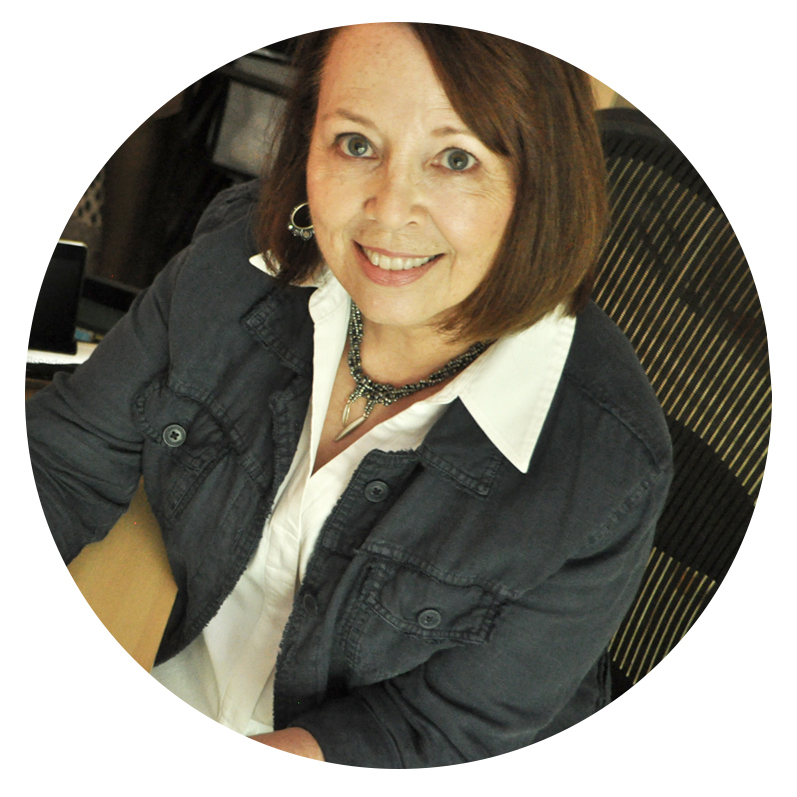 If you haven't already, you'll want to make time to check out the unique and inspiring creations of those who have already revealed their designs: Janet, Cynthia (here and here), Tanya, Bobbie, Maryanne, Hope, Lisa, Liz and Kim. I love beadweaving. Looking at your work, I'm so envy =) so beautiful. I am in awe of this~it is hard to believe that this is that shapely spool! Gorgeous gorgeous gorgeous Necklace!!! Your mind is genius when it comes to design. Screwing the spool to a base would have helped me a lot. I was not so smart in sawing mine. 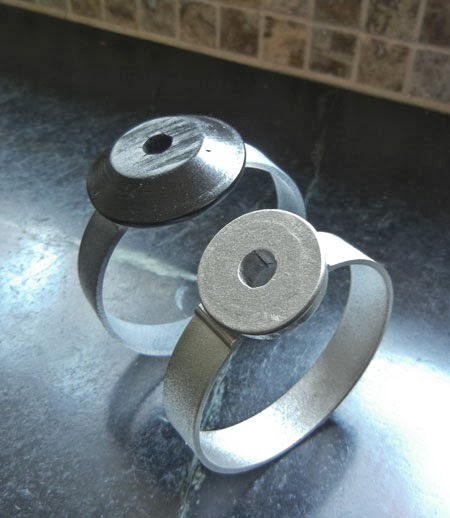 And seeing spool cuffs would really be cool (are ideas brewing?)! The individual ideas and pieces~sawing, spraying, colors scheme, estate buttons, needles, earring designs~all look like they just fell into place. I know it must not have been that easy, but your finished work LOOKS that easy. It has a wonderful, elegant flow. The needles are such a special part of the piece and a perfect way to bring it to an end. Did you all step on a lot of those needles as children? We did! The door card was such a happy coincidence. They are intriguing and beautiful and tell a stories of their own. I am thrilled that card set the palette for your piece. It is quite the beautiful necklace! Karin, thank you for embracing this idea and for being a part of this Hop. I was hopeful that you would say yes and thrilled when you did. I have deeply admired your work since the first time I saw it and think you are at the top when it comes to very wearable beadweaving. This is so gorgeous! Heck, that's not even the right word. I love the back story (!) and the sparkle and buttons and.... oh gosh I'm in love. Wow - that was quite the endeavor! And what a lovely result! This is fantastic necklace! The use of the spools is so ingenious!! Fabulous! Wow you have such a creative and inventive mind. The necklace is gorgeous with all your loves and memories wrapped up in one piece. Whoa! This is absolutley amazing and quite frankly, drop dead gorgeous! I am in awe of your creative talent! Karin, this is so lovely. It took my breath away. I love love love the needles as dangles! The elegance blows me away. The rhinestone buttons are just perfect, absolutely perfect. I get such a sense of beauty and a peaceful calmness when I look at your necklace. I have no idea how you did that, it's AMAZING. Oh .. wow! That really is amazing. And I would never have guessed spool or needles. I just cannot get over how you took those things and made them so amazingly beautiful! Oh. My. Word. You have completely blown me away with this -- my jaw dropped when I saw it, but once I read the incredible creative process that went into it, I lost all words to describe how spectacular and creative and gobsmacking this is. And to throw needles into the mix??!? Oh, my. Wow!!! This piece is absolutely awesome!! This is an amazing piece! 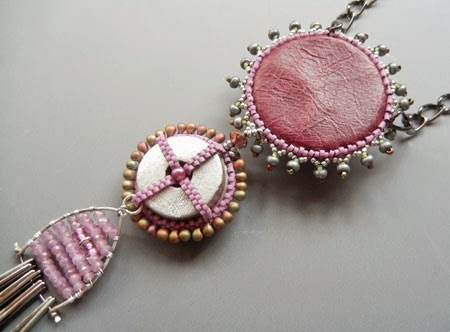 I love how you completely altered the spools and used them as a surface for your beautiful beadwork. 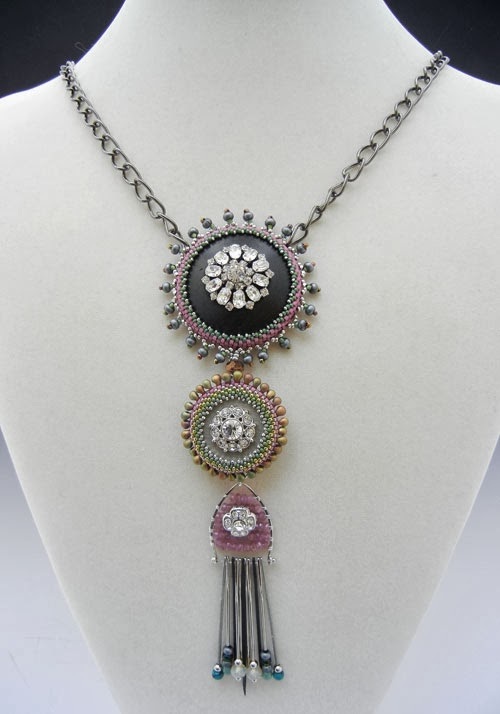 The colors and the design of your necklace are stunning. Wonderful work!